When inspecting your roof, there are a lot of things to look out for. Pinpointing roof problems while they are small and manageable will save you a lot of trouble, and expense, in the future. Even the best roofs show signs of wear after exposure to high winds, rain, snow, and UV rays. However, some areas are more susceptible to problems than others. Here are some common problem areas to check when you have a concern about your roof. Fascia is the band that runs horizontally and is situated vertically under the roof edge. Essentially it is the trim or front board along your roof line. 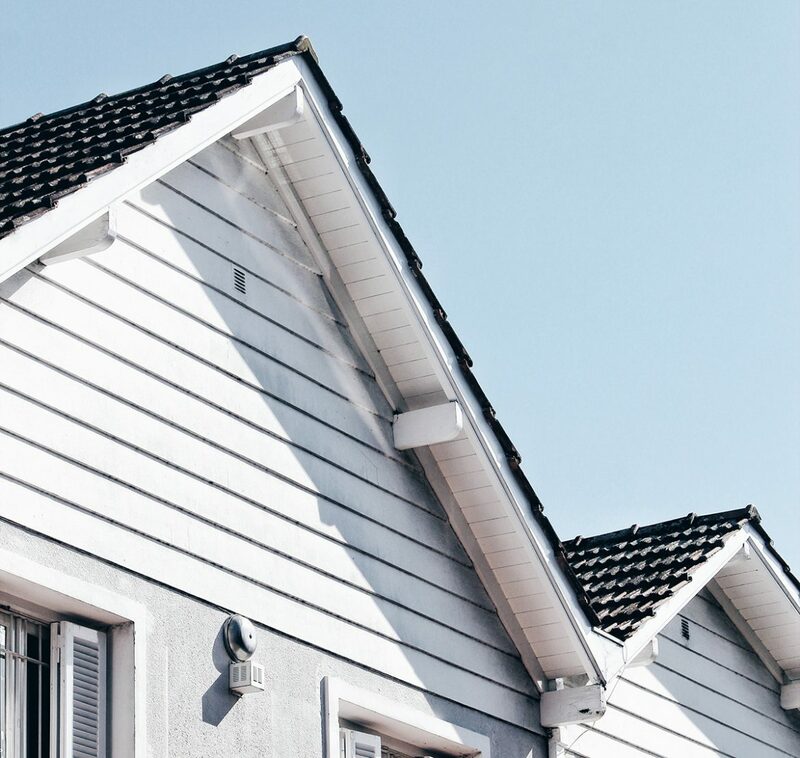 IT is connected to the ends of the rafters, trusses, or areas where the gutter is attached to the roof. Made of wooden boards or sheet metal, the fascia acts as a layer between the edge of your roof and the outdoors. It protects the wooden board against water damage that occurs from certain weather conditions. It also protects the interiors of your building from weather damage by blocking its entrance. Fascia is also aesthetically pleasing because it makes a smooth, even appearance for the edge of the roof. If you have problems with moisture, signs of rot, or damage, there may be a problem with your fascia. “Soffit” comes from the French word for “formed as a ceiling” and the Latin term for “to fix underneath”. It is the exposed surface beneath the overhanging section of a roof eave and is below the fascia and rafters. The soffit assists in ventilating the attic through small holes that provide air circulation. Air from the soffit goes to the vents to draw heat and moisture away from the house. This is important because moisture in the attic can develop rot in the sheathing and rafters. Most soffits are made of vinyl because it is water-resistant and cost-effective. Vinyl also withstands the degradation that comes from heat and moisture exposure. Vinyl also helps regulate the temperature in your attic and throughout the rest of your home, saving you money. Common problems with the soffit are cracks, holes, and rotting, which make it easy for water, insects and small animals to enter your home. Flashings are used to seal the roofs edges, perimeters, penetrations, walls, valleys, drains, and any other area where the roof covering is disrupted or ends. Made of sheet metal, plastic, or composite materials, flashing helps seal any voids in the roof system where water can enter. If water seeps into these openings, it can get into your home’s walls, deteriorating the building, causing structural damage, and creating moisture and mold problems. Weather an oxidation is the most common reasons for flashing deterioration, but they can also just come loose. Checking your flashing regularly can help prevent issues that cause water to enter your home. Gutters keep water away from the foundation of your home, protecting the structural integrity of the building. They are highly susceptible to water and debris buildup, which causes mold and mildew under your roof. However, a lot of gutter problems can be solved by the homeowner. If your gutter and downspouts are backed up with debris, it is as easy as cleaning them out. If the excess weight of leaves, twigs, and standing water causes your gutters to pull away from the fascia, there could be a problem with the hangers. Hangers are the hardware that holds the gutters to the fascia and can deteriorate over time or can be spaced too far apart. Luckily, they are easy to fix and replace. If your gutter has small holes, you can seal them by caulking the joint or filling the holes from the inside. If you have standing water, your downspouts may not have enough pitch. The rule is a quarter inch for every ten feet. Keep your downspouts extended 4 to 5 feet from the house, or water will find its way into your basement. You can also get gutter extenders to preserve your foundation. Shingles are a popular choice for offering protection and style to your roof. However, they are prone to discoloration and curling. If you have missing or broken shingles, the underlying wood could rot, develop holes or have other damage. Improper ventilation during installation can also cause your shingles to buckle. Discoloration is an indication of a roof leak and a small spot can turn into a large hole really fast. If your shingles are curling, then you have a lack of ventilation, high nails or improperly installed fasteners. Missing shingles are a direct path to a rotting roof with water, snow, and ice hitting your roof directly. Typically your shingles should last from 15 to 20 years, depending on the durability and exposure to various climate conditions. Notice a problem with your roof? Check these common problems areas or call Titans Roofing! Extend the life of your roof with proper inspection, maintenance, and repair and trust the professionals at Titan’s Roofing. Let us carry the weight. Call today for a free estimate.